A fat cat from Newcastle has scooped second place in a national pet slimming competition. Five-year-old Socrates (Socs), was chosen by vet charity PDSA to take on a 100-day diet and fitness programme. At the start of the PDSA's Pet Fit Club Socs weighed 10.1kg - making him more than double his ideal body weight. He lost a total of 1.5kg. The winner of the competition was Amber, a cat from Edinburgh who lost 17% of her body weight. Socs's owner, Bill Duncan, 52, from North Shields is still hoping his cat will reach his ideal weight of 4.5kg in the next 18 months. 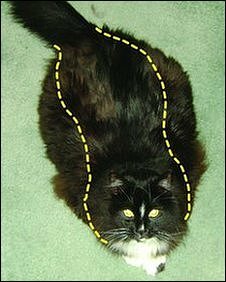 PDSA senior veterinary surgeon Elaine Pendlebury said: "It is much harder for cats to lose weight than dogs. "To lose 14% of his bodyweight is an outstanding achievement." Mr Duncan said: "Before Pet Fit Club, Socs struggled just to groom himself properly, he had no interest in his toys or exercising and spent most of his time cat-napping. "Now, he's like a different cat. He can groom himself and reach places he couldn't before. "As a result his coat is in superb condition, he has loads of energy and loves playing with his cat-toys." Socs's diet and fitness programme was specially tailored by vets and nurses at Newcastle PDSA PetAid hospital.